O my! So much can happen in a week ( I know I really should not be surprised by this still… but somehow I am). Once again this post will be mainly information based to update everyone. I actually don’t have much more to write other than information at this point, as everything is still new! I will start with what happened the afternoon of my last post and bring you up to speed. Met with my current Medical Oncologist (specializes in all types of chemo, not just related to brain cancer), Dr. Neville. I was expecting alot from this appointment. Steve, my family and I had done hours upon hours of research and went into this appointment with many questions about possible treatments, different doctors and cancer facilities. He immediately shot everything down and did not even have a “plan” in place for further treatment for me. He said that his nurse was off sick so he was unable to have my case reviewed by other doctors. There was no point to the appointment, as we had nothing answered and no “next steps”. I left feeling very, very defeated, sad and depressed. I really felt that Dr. Neville did not care at all. After dinner I started loosing vision in my right eye (the side of the tumor). It seemed as if a windshield wiper was moving across my eye… sometimes I could see fine, sometimes 50% sometimes 75%, etc. etc. This continued until bed which a horrible headache in a spot I have never had before (back left of my head). The vision troubles continued, although this time I just need to really really strain to see anything from my right eye. This straining was making my normal pressure headache (at the front of my head) much worse, and I still had the horrible headache at the back. Over the course of the day I had a number of seizures. When Steve got home from school we decided to get it check out. We went to Sunnybrook Hospital in Toronto were we stayed until yesterday afternoon. We got a private room in emerg shortly after arriving (even though the emergency room was PACKED!!!) and I was very thankful of that! First they did a CT Scan which seemed to showed a lot of swelling around the tumor, so I was immediately put on a Steroid (Decadron) to bring down the swelling. This, combined with pain medication, helped me see better and took away some of the pressure. Steve and I did not get much sleep that night as I also had a Chest X-ray, EEG, Bloodwork and the other normal emerg monitoring. I was admitted to Hospital around 4am, however it took until noon on Tuesday to be transferred to a floor (which was actually fine with us, as I will get to in a moment). A neuro doctor who had seen me overnight ordered an MRI which I had first thing in the morning. They prepped me for surgery (most likely a biopsy the technician said) during he MRI, which was quite a surprise and worried me slightly. I did not end up having surgery. I was moved up to the neuro ward around noon and my parents arrived just in time to meet with a wonderful neurosurgeon. He reviewed the scan I had earlier in the morning to my previous scans at Juravinski. He told me that surgery would not be an option for me, as the tumor takes up almost a quarter of my brain and is wrapped up in blood vessels. Removal would cause extreme personality changes and would most likely cause a stroke. He believes that the tumor is still the same grade and there might be some growth or it might be swelling. There was not much he could do for me, but he did put in referrals to meet with a neuro-oncologist and a neuro-radiation oncologist the following morning at their cancer center (Odette Cancer Center). I was very, VERY happy to hear that I would get the chance to speak with doctors at the Odette Cancer Center, as it is one I really wanted to get in to. The neuro-surgeon was going to have Steve and I stay overnight again in hospital, however, there were no beds so we spent the entire day in the hallway of the neuro ward. Finally we convinced them to let us go and we went to stay with my parents at a friends house at about 7:30pm. What a long day!! 8am appointment with Dr. Sahgal (neuro radiation-oncologist). He saw increased activity in the tumor, but also does not believe that it is a higher grade tumor. He does not see radiation as being the best option for me yet, as the area that would need to be radiated is much too large and would have too many long-term negative side effects. He explained that Cyber Knife and Gamma Knife (two types of extremely targeted radiation) would not be an option for me as the tumor is too large and not one solid ball. Great doctor! I then went on to meet with Dr. Perry which was a fantastic appointment! Dr. Perry is very, very well known and head of the division of neurology at Sunnybrook and head of the Brain Tumor Consortium of Canada. Great guy to have as a doctor! Not only is he a neuro-oncologist, but he is also a neurologist so could technically be a one-stop shop for me! He spent a long time with Steve, my parents and I discussing what he thinks would be the best course of action. He agreed with what I had been told already at Sunnybrook that surgery, Cyber Knife and Gamma Knife would not be an option given the size of the tumor. These options could be considered if a portion of the tumor was ever “upgrade” to a Grade 3. He suggested going on daily chemo for a year straight. This would be the same type of chemo I was on last year, at a lower dose (about 80 mg/day not 230mg 5 days a month). His reasoning is very logical… this lower dose of chemo will match the growth rate of the tumor. If only a handful of cells are growing daily we need to kill these cells each day. Not blast the tumor with a high dose of chemo for only 5 days a month. What about the other 21 days? Those 5 days of chemo are not the only days the tumor is growing. It makes a lot of sense to me! He explained some risks associated with doing this, and we will be researching further. The key to this strategy is starting it when the tumor is indeed growing. So, we have set up another MRI at Sunnybrook in 6 weeks time to confirm growth before starting this treatment (if this is what we decide to do). He was an AMAZING doctor who made all of us feel at ease, hopeful and gave us some options once again. All of the doctors who I met with over the past few days suggested I need to increase my dose of anti-seizure medication so I am back to full strength. Haven’t been on it long enough to notice any changes. Once again, thank you for the overwhelming support with the penny drive!! I am so honored and touched with all the pennies, donations and wonderful support that has been coming in. Thank you for that 🙂 If you have any questions or suggestions I would love to hear your input! The more I know the better I think. As always thank you for your support, lover and encouragement! The support we have received for fundraising to assist with my future treatments has been overwhelming. Thank you all SOOOOO much! In order to co-ordinate everyone’s efforts we have added two new pages to the blog. Both of these are found along the top menu of the blog website. Firstly, the Penny Drive page explains the three ways that donations can be made and provides a list of local businesses who are collecting pennies (if you would like to drop them off). If your business, school or community group is collecting pennies for us thank you, and please let me know so that I can add you to the list at the bottom of this page. 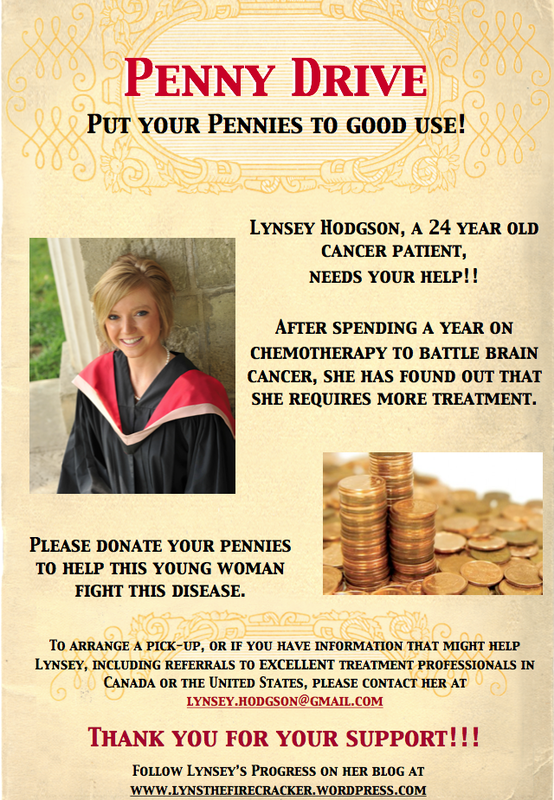 Alternatively we can pick up your pennies from you or you could take your pennies to your local bank and e-transfer the funds to lynsey.hodgson@gmail.com. Please contact me if you have any question! Secondly, I am thrilled to announce that Jenna’s Jems are back in business! Jenna now has her own page on the website that provides information on how to purchase her beautiful handmade bracelets. As some of you may remember she made hundreds of bracelets last year to raise money for the Spring Sprint in support of the Brain Tumor Foundation of Canada. This year, she is making her bracelets in support of me and I am very, very honored! She has some ready to go already and will be making more and taking orders if you would like any custom designed ones. Please check out her page (along the top of the website) or contact her mom, Dianna Landry at dianna_landry@hotmail.com. Thank you all for your never ending love, support and encouragement. I wanted to update you, and ask for your support. I do not know much at this point, and will be brief in this post. I promise to update you as I am able. I appreciate your understanding with the strictly factual nature of this post. On Friday February 8, I had my post-chemo MRI. I was phoned a week later (Friday February 15) with the official results of that scan. My tumour has grown. I have an appointment with my current oncologist this Thursday to discuss the results and further treatment options. His secretary told me he is making a referral to a radiation oncologist. Steve, my parents and I have been researching other options all weekend. We will be having second, third, and forth opinions. I will be switching oncologists and cancer centres. I want to centre that specializes in brain tumours. We have discovered some promising leads in both Ontario, Quebec, and across the United States. If you know of any excellent treatment professionals or options I would love to hear from you. I have been very blessed with much financial support this past year. This money greatly assisted with paying for my medications, enabled me to explore complementary therapies that truly contributed to building my immune system and overall strength, and took away some of the stress I was faced with. This money is almost all gone, and Steve and I were counting on me being back to work within a month. At this point I do not know what the coming weeks and months will bring for treatments (in Canada or the United States) or work. I am starting a penny drive to assist with upcoming medical costs. I have attached a poster below that you could share with friends and family, post at work or at a community centre. I GREATLY appreciate your support and help. I will be in touch again as soon.